Support for PIPA, the Senate version of the notorious Stop Online Piracy Act, is dwindling faster than most media outlets can keep up with them. If you woke up to an article today that reported that X number of Senators have dropped their support for the Protect IP Act, you can assume they under-counted. Many Senators just don't like that PIPA anymore. Well, that's not counting the lead writer of the bill, who says Wikipedia, YouTube, Flickr, The Huffington Post and other PIPA-hating sites wouldn't be affected. Let's get to him in a moment. The Protect IP Act is the less extreme but still controversial Senate version of SOPA. Both bills have ostensibly been written to fight online piracy conducted by foreign websites, but vague language (at best) and ulterior motives (at worst) allow both bills to be read as measures that would empower movie studios, record labels and video game companies, among other rights holders, to delist sites they believe infringe on their copyrights and choke those sites of their financial support with minimal court proceedings to allow suspected sites to defend themselves. SOPA and PIPA spurred the web blackouts yesterday that saw Wikipedia, Reddit and others go dark. The New York Times reports that at least 10 former PIPA-supporting Senators flipped yesterday during widespread online protests against the controversial bill. "It's critical we protect the intellectual property rights of our businesses and fight online infringement, but at the same time, we can't do harm to the internet, the Constitution, or the ability of businesses to grow and innovate. Internet piracy is illegal, and we need to find a way that works for all sides. The current Protect IP Act needs more due diligence, analysis, and substantial changes. As it stands right now, I can't support the bill moving forward next week." If you pull up a copy of PIPA, you see a bunch of names of Senators who sponsored the bill. Even two of the top namers there, Utah Republican Orrin Hatch and Grassley have bailed on the bill. "Thanks to all those who contacted us expressing their concerns about S.968, the PROTECT IP Act. "The Senator has met with people from many parts of the internet community – from users to start-ups to big internet firms like Google, Facebook, and Yahoo – to hear out their issues and to better understand all the concerns regarding this proposed legislation. Many have conveyed to us their legitimate concern regarding the need to maintain a vibrant and innovative online environment, and we are sensitive to this concern. The senator, and his staff, will continue this conversation with the online community with the hope that the issues raised can be positively addressed within the legislative process. The PROTECT IP Act seeks to address the very real problem of intellectual property theft online and copyright infringement, but it must prevent unintended consequences, and must also contain sufficient due process protections to ensure that legal activity over the internet is not disrupted. "Please be assured that we will stay in contact with members and representatives of the online community as the process unfolds." Website Pro Publica, which hasn't caught up with the Grassley news yet (they will), counts the declared PIPA positions in the Senate as 39 for, 19 against, 7 leaning no and 36 unknown. The bill, which is scheduled for a vote on January 24 would need a majority to pass and 60 to overcome a Filibuster. 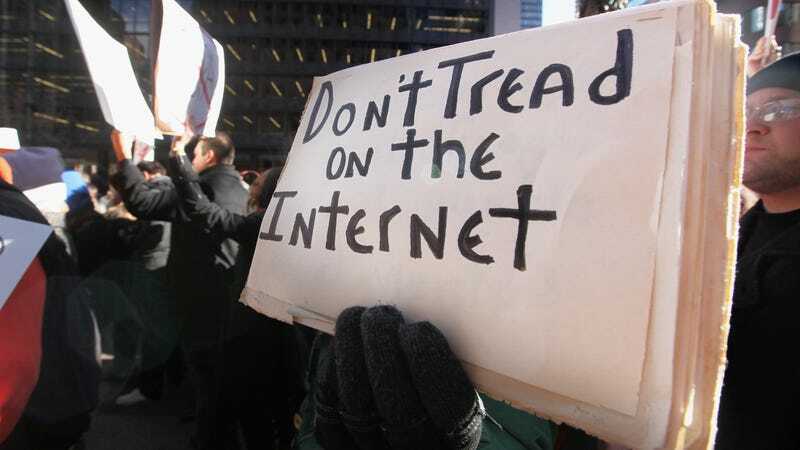 The Times reported that as many as 20 members of the House may have turned on SOPA yesterday. Pro Publica's count is mostly full of unknowns, but the nays are currently more than triple the yays. Does this mean the protests worked? They certainly turned up the heat. SOPA was already in trouble, as it seems to have stalled in the House, where leaders say they won't bring it to a vote until there is consensus—which there surely doesn't seem to be. And here's something else to consider: the little-heard argument that maybe PIPA isn't the horrible thing SOPA was. That is, of course, in dispute, though PIPA lacks the broadly-written prohibition against streaming. PIPA goes after "nondomestic domain names", which may or may not get the U.S. sites that were within SOPA's line of fire out of PIPA's sights. But it would still give copyright owners easy access to court orders that would compel search engines to delist supposedly-infringing sites and require payment providers and ad providers to suspend support. Anyway, with enough people piling on PIPA or pulling away from it, how about we check out the best—the only?—major defense of PIPA. Websites "going dark" today in protest of the PROTECT IP Act will not be affected by enactment of the legislation. FACT: None of the following websites meet the definition of a site dedicated to infringing activities: Wikipedia; YouTube; Flickr; Twitter; Google; craigslist; eBay; The Huffington Post; Yahoo!. While some of these websites do contain infringing content, each one clearly has a significant use other than infringement and therefore could never meet the definition contained in the PROTECT IP Act, even if they were based overseas. The PROTECT IP Act is clear: the definition of an Internet site means "the collection of digital assets, including links, indexes or pointers to digital assets, accessible through the Internet that are addressed relative to a common domain name." (See S. 968, The PROTECT IP Act, page 32.) This includes sub-domains linked from a top-level domain name. Websites like Wikipedia, YouTube, Flickr, Twitter, Google, craigslist, eBay, The Huffington Post and Yahoo! do not meet the definition of a website "dedicated to infringing activities," and the PROTECT IP Act does not reach websites where only a sub-domain is dedicated to infringement. While some sub-domains generated from these top-level domain names do host infringing content, and may even be dedicated to infringing content, the top-level domain and its sub-domains cannot be "taken down" as opponents suggest because the entire website must be dedicated to infringing activity. Protecting copyrighted materials promotes free expression, and courts have long-held that enforcing intellectual property rights – including copyright – does not stand in opposition to the First Amendment freedoms that promote free speech. The PROTECT IP Act does not make any activity illegal that is not already illegal – and stealing another's intellectual property or copyrighted materials is illegal, in the physical marketplace, or in the virtual world of the Internet. The PROTECT IP Act does not expand the scope of existing copyright law and preserves important protections such as fair use, which remain in place as they would in any other context. It merely strengthens the tools available to combat online activities that are already illegal under U.S. law. As renowned First Amendment scholar Floyd Abrams has written in support of the PROTECT IP Act, "copyright violations are not protected by the First Amendment." And, yet, at least 10 Senators dropped support for the bill one day ago.